Lucy is the third grandchild we have brought up to Hopi. We always start out at our friends on 2nd Mesa, Joseph and Janice Day. Janice is Hopi and Joseph is Anglo though after so many years here he has certainly acquired a great deal from his adopted people. The Days own a small trading post, Tsakurshovi, just at the top of Second Mesa, where they buy from the Indians who come in from all three Mesas with their art works. The Days then bring their practiced eye to the objects and make their choices. You can be sure that everything is authentic. It was slightly chaotic when we arrived at the Days’ home that Saturday because it was the weekend of Home Dance. This is the last katsina dance of the year before the katsinam leave to go to their home in the San Francisco Peaks. 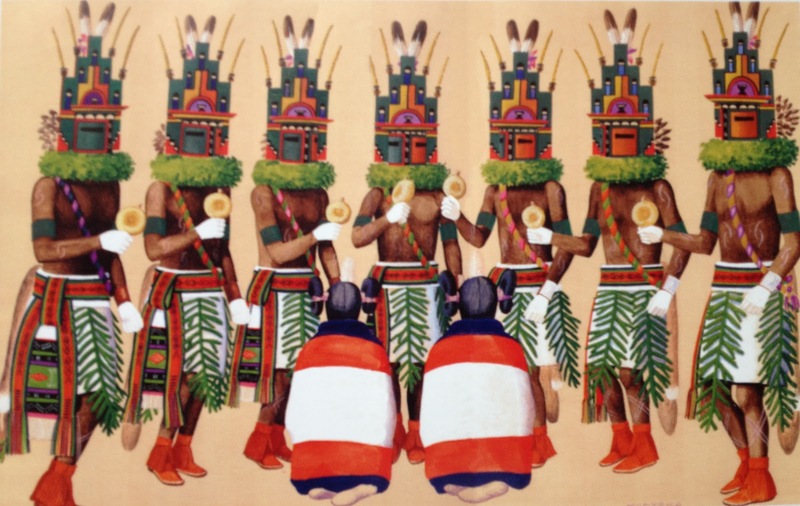 After all the Villages have celebrated the Home Dance there will be only social, non-religious, dances, until the katsinam return in the fall. The weekend we were there the Home Dance was at Janice Day’s village, Shungopavi. It is traditional that when the dance is at your Village to entertain all who come and feed them all day. That means family, friends, visitors and clients. There was more food than one could eat, corn, chili stew, enchiladas, turkey, fruit salad and I mustn’t forget all the pies, which came in every imaginable flavor. At the “Cultural Center,” as it is called, there is a motel with, unfortunately, poor management. Having gone annually for the past 20+ years we know what to expect so we even had room numbers with our reservation, rooms next to each other on the top floor (ie the 2nd floor). After over 30 minutes we got two rooms on the ground floor with a room in between (a family of 8 sleeping in shifts)! Finally, we could go off for the main purpose of our visit, to show Lucy a katsina dance. The dances go on from dawn til dusk (except when they don’t) and this weekend they were at two different villages. The dances are never identical and are varied during the day. No one, except a few of the villagers who live on the plaza, stays for a full day. Our tolerance is usually for a single dance per village which varies, but usually lasts up to 45 minutes to an hour. At the first village we went to, Oraibi, they were doing a Long Hair Katsina dance. There are many different katsinam and many varieties within each category. The Longhair happens to be one of my personal favorites. At the village we visited next, Shungopavi, they were doing a Hemis Katsina dance. At least during the hour we were there, it was the more interesting. Many dances have a gift giving part to them and they are always different. In this case, most of the gifts were toy bows and arrows for the boys and Katsina dolls for the girls and small baskets of fruit for the adults. Usually these are destined for members of the dancer’s family as well as certain select friends. At some dances they actually throw individual pieces of fruit. 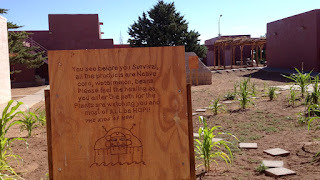 I once found myself on the plaza with Hopi friends and one melon was thrown directly at me. Rather than catch it like an Indian should, I ducked! Many Anglos and Indians watch from the roofs of the houses around the plaza and on this particular day some younger Hopi had to scramble down from the roof to collect their gifts. There were so many gifts to give out at this dance that the ceremony took quite some time. What I found especially marvelous at the Hemis Katsina dance were the katsinmanas (katsina maidens). Since women are not allowed to dance in a katsina dance (just social dances) the mana’s are actually men. 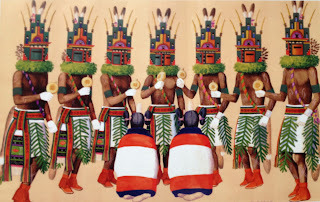 During part of the dance they kneel on the ground in front of the Hemis katsinam and play rasps on resonators while the Katsinam rhythmically shake their rattles. The sound in the small plaza was absolutely mesmerizing. As I am sure I have said before the katsinam dance in order to bring the rain. Happily it worked extremely well this year and we had such a lightning and thunderstorm that the electricity went out at Shungopavi for three hours and we were in the dark!